The adage “choice is the enemy of decision” certainly holds true for optimization solutions. As banks move towards optimizing customer decisions, the many choices available make it difficult to know what works best. While some optimization solutions are purely software-based “solvers,” others offer more, such as modeling services or domain expertise within a given decision area. Moreover, choice is not the only challenge. Historically, many solutions are highly academic and not built to meet real-world requirements. So, what are the right criteria to evaluate an optimization solution? 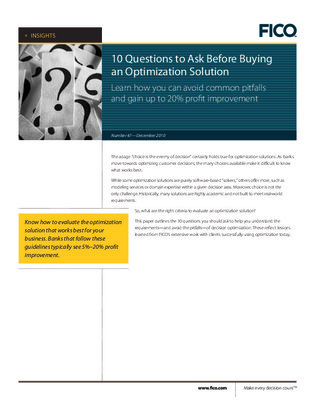 This paper outlines the 10 questions you should ask to help you understand the requirements – and avoid the pitfalls – of decision optimization. Read more about the lessons learned from FICO’s extensive work with clients successfully using optimization today.